Of course, all laptops and stereos come with built-in speakers. 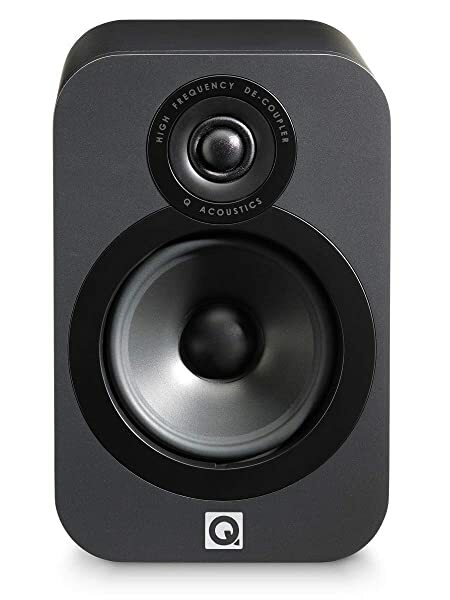 However, investing in a set of bookshelf speakers is an easy and affordable way to transform your listening experience. This is a must for music lovers and those who want to create a mini-home theater. 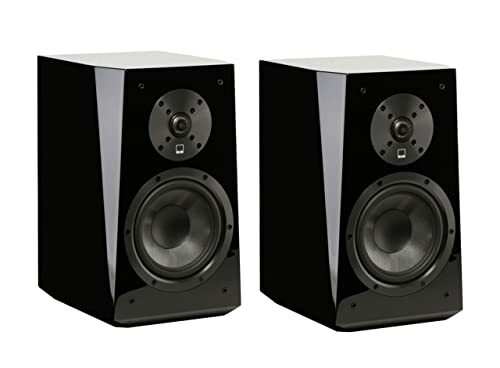 Bookshelf speakers are very easy to use and compact enough to fit into any room. They can be positioned to provide a surround sound experience. Of course, the quality and features of different models varies widely. Audiophiles who are looking for a two-channel speaker will be in their element with this model. 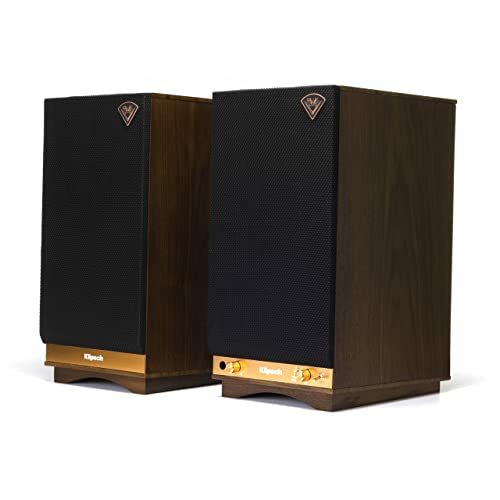 The SVS Prime Bookshelf Speakers provide crisp and very accurate sound across all music genres. 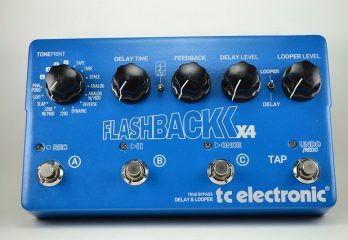 The enhanced bass is also very impressive and will get the party started. Anyone who wants to create a home cinema experience will also be pleased with these speakers. The speakers provide the perfect surround sound experience. This helps to make watching movies even more enjoyable. The front panel of the set features a top of the range 1-inch FEA-optimized aluminum tweeter. This is paired with a 6.5-inch polypropylene woofer to provide rich and deep bass. The frequency range is 48Hz–25kHz, while the sensitivity is 87dB. For the best results, the speakers should be used with an amplifier that provides 20–150 watt of power. The SVS Prime Bookshelf Speakers probably won’t win any beauty contests, and they are bulkier than truly necessary. But in terms of sound quality, they are an excellent option. Boasts an expansive sound stage. Not possible to add extra speakers. With nearly a hundred years of experience, ELAC is without a doubt one of the industry leaders. The company has created a huge range of popular speakers to date. For those in the know, the Debut series is among the best. What makes Debut so special? These speakers are compact enough to fit in even the smallest corner without being obtrusive. However, they really pack a punch in terms of sound and quality. A special 1-inch silk dome tweeter can be found at the front of each speaker. This is teamed with a 6.5-inch Aramid-Fiber woofer and an enhanced bass port. 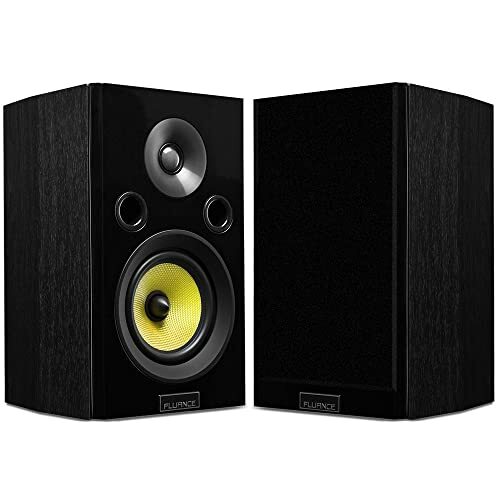 This means that the speakers are best suited to medium sized rooms. 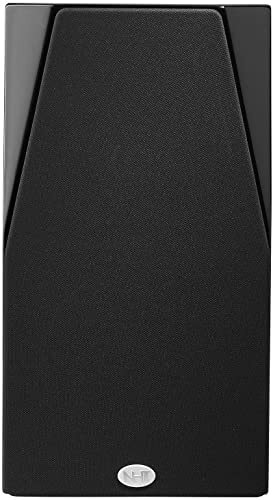 The speakers deliver a response range of 44Hz–35Hz response range combined with 87dB sensitivity. 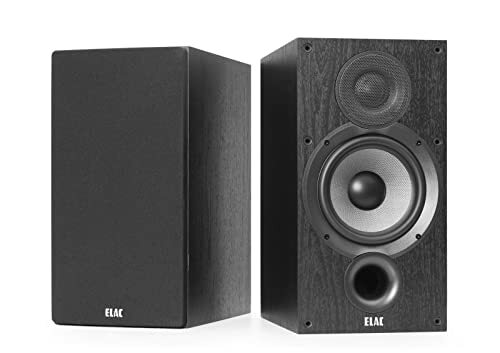 ELAC have used their experience and expertise to deliver plenty of performance. The special front port allows the speakers to be placed against the wall if desired. They come with solid stands and can be hidden easily. However, the cool design means that most owners will want to display their speakers with pride. Slight tonal shaping and coloration. 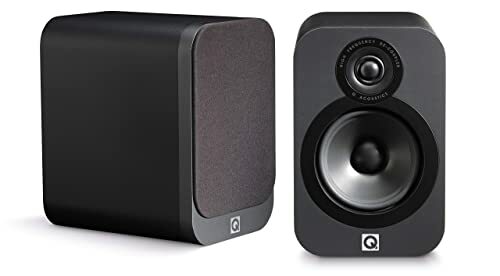 Q Acoustics has created bookshelf speakers that provide an excellent soundstage and impressive detail. The best part? A full collection of top of the range features come at a budget price. Taking first impressions into account, the 3020 model is clearly ahead of its class. This model is known for its low distortion combined with excellent dispersion. Like other models in the 3000 Series, the 3020s utilize the renowned Concentric Ring Dome tweeters. People who demand high-quality sound are sure to be impressed. The recommended power is 25–75 watts, while the frequency response is 64Hz–22 kHz. This comes with an impressive sensitivity of 88dB. Although Q Acoustics was relatively unknown until recently, the company is already making waves. Taken on face value alone the speakers do not really impress, but the sound they deliver more than makes up for this. 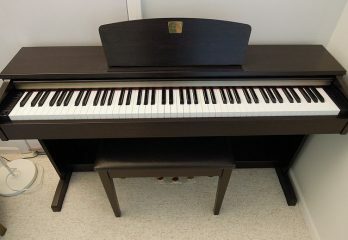 This model has been updated and features a new crossover as well as enhanced internal bracing. The recessed binding posts make wall mounting easy, while the speakers can also be setup close to a wall. People who need a little more power can achieve excellent bass extension with the perfect amplifier. The 1-inch soft-dome tweeter serves to balance out the speaker’s warm tonal balance and delivers an extra bite. These speakers truly prove that looks are not always everything. Not an especially attractive design. 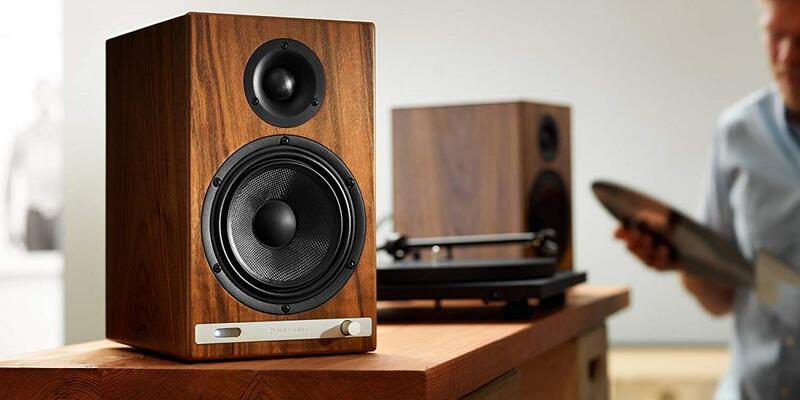 Are you looking for speakers that deliver excellent sound quality but are also easy on the eye? Fluance has created a good option for both audiophiles and style lovers. 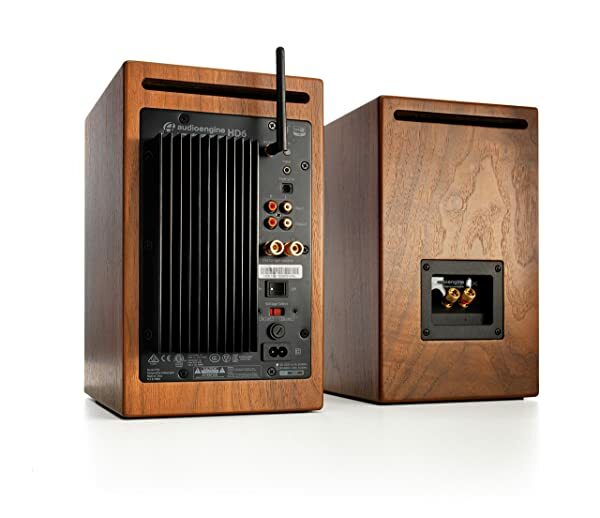 The speakers come in an attractive wooden cabinet that comes in a range of colors. However, this cabinet is not simply a pretty face. It is specially acoustically tuned so that it delivers a warm, distortion-free sound that will set toes tapping. The sound quality has been perfectly calibrated to deliver a powerful punch. The room-filling stereo sound is also ideal for watching movies and playing video games. This is the perfect way to get the party started. The speakers come with an integrated class D amplifier. The amplifier is in turn softened by the soft-dome tweeters to keep the highs sounding natural. The enhanced glass fiber drivers also serve to bring up deep bass and detailed mids. The speakers can be connected to a wide range of devices including microphones, gaming consoles, PCs, and turntables. 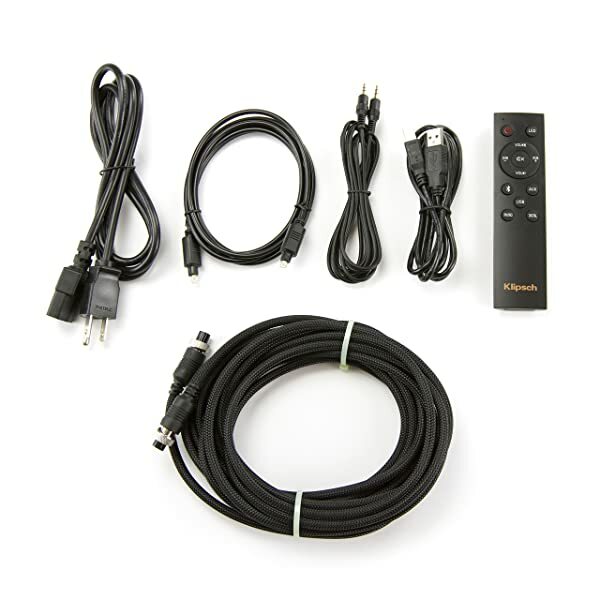 They are very easy to install thanks to the special plug and play connection. Both RCA and Bluetooth aptX are fully supported. In this case, high-quality sound does not mean compromising on style. The wooden cabinets deliver excellent acoustics. The imaging is almost perfect. Supports RCA and Bluetooth connections. A separate equalizer may be needed. No optical port or subwoofer out. The RCA wires are poor quality. The speakers are part of the extensive D range from Defensive Technology. It has to be said that some models in this series perform significantly better than others. Unfortunately, the D9 is not likely to win any awards. On paper, everything looks good. The suggested amplifier wattage is 20W-150W per channel. So far, so good. The sensitivity is 88dB, which is reasonable enough, while there is a 1-inch tweeter. Unfortunately, the midrange is recessed, which means that the vocals tend to sound muffled. This might not sound like much, but it can be rather frustrating when listening to your favorite diva hit the high notes. Fortunately, the stereo sound stage and imaging is impressive enough to make up for this. Well, almost. If you tend to listen to music that doesn’t feature a lot of vocals, these speakers are an ok option. Not as impressive as hoped. The midrange is a little disappointing. Style lovers rejoice. 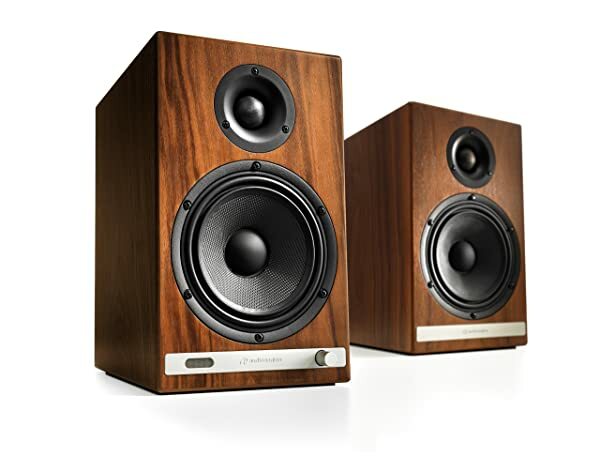 These stylish speakers come in an attractive walnut casing and are designed to integrate easily with the décor of any room. OK, so they look cool, but how do they perform? Fortunately, the speakers deliver a crisp and textured sound. This is largely due to the single 4″ spun-copper Injection Molded Graphite woofer combined with a 1-inch aluminum Linear Travel Suspension tweeter. At 68Hz-21kHz, the frequency range is also impressive. Are you planning a party? You can crank up the volume without experiencing distortion. 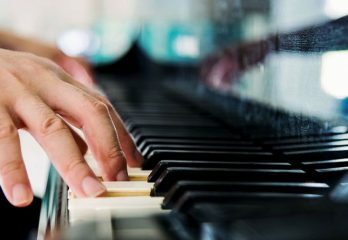 Favorite tunes can be appreciated in a whole new way as every note can be heard clearly. The speakers are fully powered, so no separate amplifier is needed. The sensitivity is 106dB, which helps to make them much more versatile. 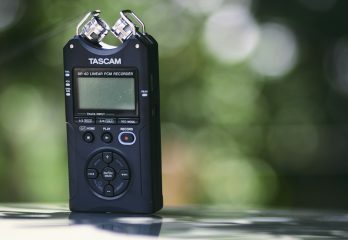 However, the sweet spot is much smaller than average meaning that sound quality varies dramatically depending on where you are sitting or standing. The only drawback is the fact that the speakers are forward sounding. This means that users should put some distance between themselves and the speakers to avoid being blown away. Unless of course, you like that sort of thing. The bass presence is impressive. Not ideal for larger rooms. Maximum volume requires separate power. The sweet spot is very small. Need to be positioned carefully. Are you ready for something a bit different? The YU6 from Kanto comes complete with a moving magnet phono pre-amplifier. This is a real boon for vinyl lovers who don’t want to invest in a special player. But that’s not all. The speakers feature a special 24-bit/96 kHz DAC. This delivers enhanced performance when streaming high-resolution digital audio from a Smartphone or external streamer. The speakers boast a two-way ported design complete with a 5” Kevlar woofer. The 1-inch soft dome tweeter is powered by a 200-watt class D power amplifier. This amplifier splits the power between each loudspeaker to deliver the perfect balance. The speakers are tethered together with a special loudspeaker cable. The left channel is the active speaker of the pair and must be plugged into a power source using the power cord. This needs to be considered as it can affect the setup location. Users are likely to find that they spend quite a bit of time getting the distance from the wall just right. Those who have enough patience will be rewarded with a powerful sound. However, get the calculations even slightly wrong, and you will be punished by a rather muffled and muddy sound. Although novices might find all the bells and whistles a bit overwhelming, true tech heads are sure to be in their element. Simple and effective wireless performance. Very sleek and stylish design. High performance when streaming files. A bit technical for novices. Can be tricky to set up. With their celebrated Signature series, Fluance has attempted to create high-quality bookshelf speakers for the budget market. Have they succeeded? This depends largely on the needs and preferences of the user. The speakers are very well balanced and bring out extra nuances in the music. Music lovers will be in their element and can hear their favorite tunes in a whole new way. They especially excel when it comes to classical and folk music. The speakers come with a 5-inch woofer on the front that is matched by two bass ports. While the bass is a little underwhelming, this is balanced out by other factors. The speakers can take 30-120 watts of RMS power at eight ohms. The speakers feature a wide sweet spot, which means that finding the right position is easy. And good sound quality can be enjoyed by people in various parts of the room. This also makes the speakers good for home cinemas. It is very easy to switch between home theater listening and music listening. The Fluance speakers help to sharpen and define the mids and the high-end in a home theater mix system. 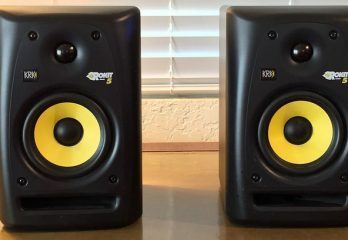 While these might not be the loudest speakers around, they perform well all things considered. The highs, mids, and soundstage are sure to impress, while the design is cute and simple. The bright yellow woofer features a textured driver with a prominent horn in the center. A smooth tweeter can be found above the woofer to create an eye-catching and fun look. The speaker cabinets are made from standard MDF and feel solid. While the connections may not be the most advanced, they are very easy to use. Even novices will be able to set up this smart bookshelf speaker system. Comes with special magnetically attached front grills. Does not feature a subwoofer. A little more style than substance. The bass is not very powerful. 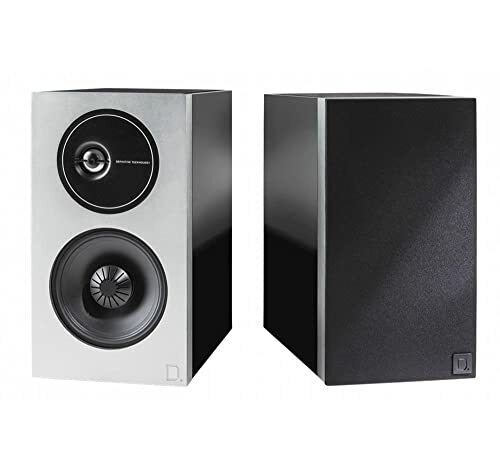 Are you looking for a set of Bluetooth bookshelf speakers? If so, Audioengine has created an excellent option for demanding music enthusiasts. People who insist on perfect sound quality should sit up and take note. While the best quality has only been possible with traditional speakers to date, the HD6 is here to change this. 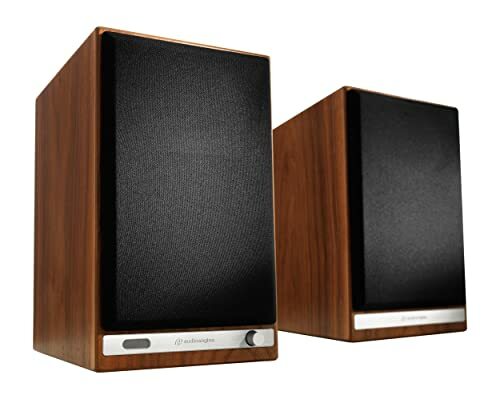 These special audiophile-grade wireless speakers have been designed for both desktop and living room environments. The speaker’s boast a class A/B dual analog monolithic amp that supplies plenty of boost to the 2.75-inch Kevlar woofers. A 3/4-inch silk dome tweeter can be found on top of each woofer. Each speaker also has an RMS of 15W and peaks at 30W per channel to achieve 60 watts of peak power. The HD6 provides users with control right at their fingertips with support for Pandora, Spotify, and Tidal. 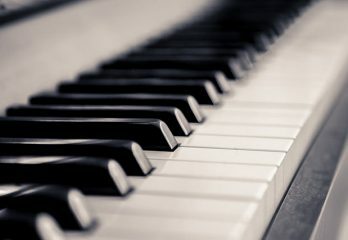 Managing a music collection is made extremely easy, and there are numerous ways to connect to online libraries. The HD6 comes with an optical input to allow high-res digital from any type of smart device. Support comes in a wide range of forms, from 24-bit/192kHz digital audio to Bluetooth aptX HD, and subwoofer output. There is even a handy remote control for ultimate convenience. Pretty much the only thing the speakers don’t do is make coffee in the morning. Features a built-in headphone jack. Digital and analog connections available. Comes in a range of cool colors. Top frequencies tend to sound subdued. Novices may find the features overwhelming. Like the Classic Three but want something a bit more up to date? The NHT C-3 is the perfect solution. These 13.75 x 7.5 x 10.125-inch speakers deliver a deeper, more impactful bass. The range of the bass is impressive as it dips all the way down to 40Hz. This means that there is no need for a subwoofer. Pure power is delivered by the aluminum cone and dome design coupled with the enhanced 3-way acoustic suspension. The frequency response is 55Hz–20kHz, while the sensitivity is 87dB. For perfect performance, 50–150 watts per channel is recommended by the manufacturer. Although the C3 was released more than a decade ago, it manages to outperform many newer models. 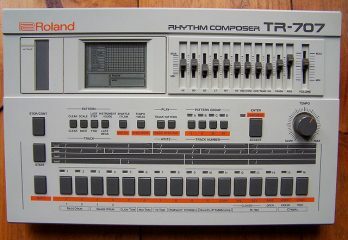 In addition, the neo-retro design is difficult to improve on. Slightly concave upper edges break up the rather boxy design to provide a real talking point. When the speakers are paired with a good amplifier, the sound quality is pure magic. Speaking of pairs, this speaker is sold individually, so it is necessary to place separate orders for each one. However, it is a good solution for anyone who requires three speakers, for example, for use in home cinema systems. The stabilizing bar can be a bit tricky. The design is a little boring. Need to purchase each one individually. With so many different models contenting for pole position, selecting the best bookshelf speakers can be tricky. There are so many aspects to take into consideration and enough technical terms to send novices running. So, let’s break things down a little. 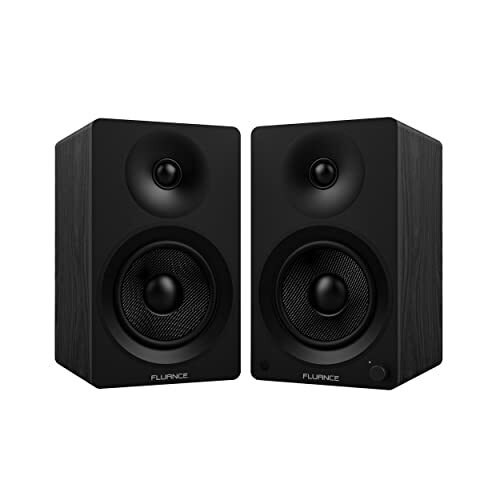 As the name suggests, bookshelf speakers should be compact enough to be placed on a bookshelf. While these models tend to be small, they can still be powerful, especially when hooked up to an amplifier. Like any other speakers, key features to look for include sound quality, ease of use and versatility. The perfect speakers should deliver excellent sound quality to all areas of the room. However, this will be affected by the size of the room as well as factors such as couches and rugs. 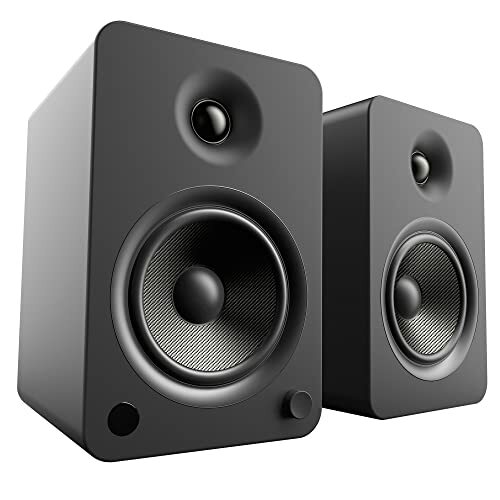 Small speakers tend to sound best in smaller rooms, while larger rooms typically require larger speakers. If you are a technology geek, you are likely to know the desired specs straight away. If not, it might be worth seeking a little assistance from an expert. Key specs to consider include power output, input types, output types, frequency range and if the speaker is active or passive. Many people believe that wireless speakers are of lower quality, but this isn’t necessarily the case. Some wireless speakers deliver powerful sound that is sure to impress. These speakers are also compatible with the leading Bluetooth technology. Many of the leading wireless speakers impress with the high quality of their sound. The main advantage is that there is less clutter. There are fewer wires to connect, and this means that the speakers offer more flexibility in terms of positioning. 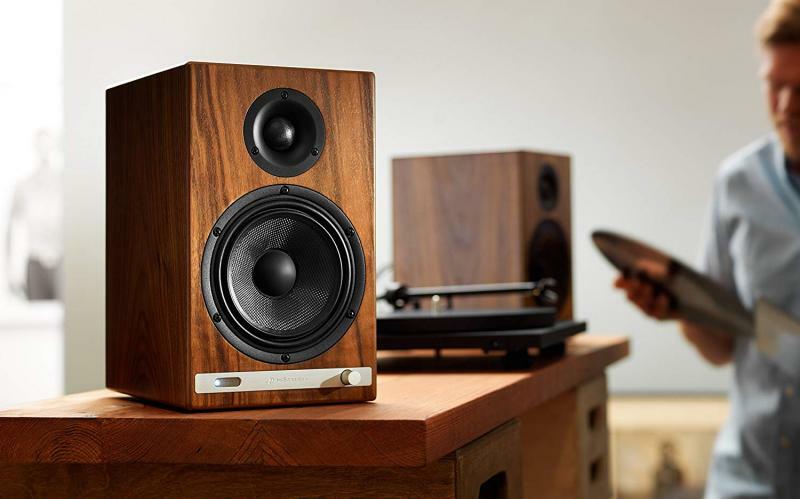 Traditionally, bookshelf speakers have been passive. This means that they have to be powered by an external amplifier. People who choose passive bookshelf speakers will naturally need to make sure they have an amplifier up to the task. However, these days many people tend to run media off their laptop or PC. This eliminates the need for an amplifier. However, much higher sound quality will be achieved with the use of a dedicated amplifier. Active bookshelf speakers are becoming increasingly popular as they come with built-in amplifiers. In fact, there are usually two amplifiers with one for the woofer and one for the tweeter. However, some form of audio feed such as a mini-jack from a Smartphone or a tablet is required. Before purchasing bookshelf speakers, it is important to consider the wattage. This is essential when it comes to passive speakers as they need to be matched to an external amp. Read the product description carefully and find the suggested amplifier wattage. If the speakers are not correctly matched to the amp, the optimum volume level will be reduced. Turning the volume higher than a particular level will result in speaker distortion. If the amp is underpowered, it is likely to stop working or even explode after a while. 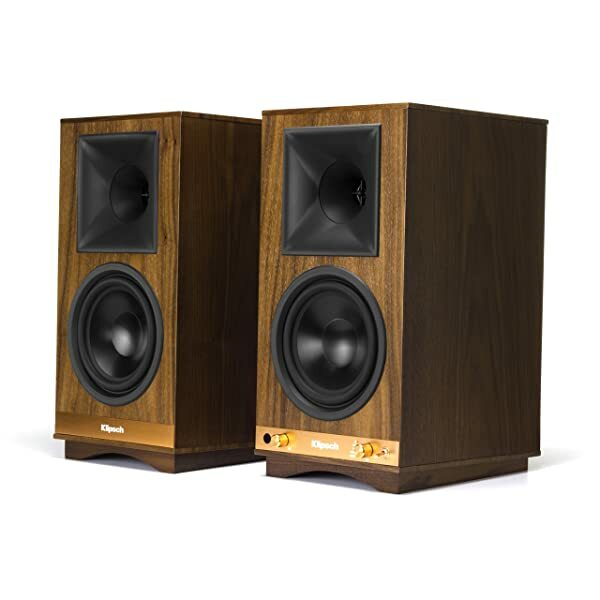 Most bookshelf speakers tend to be aimed at a certain sweet spot such as in front of a sofa or laptop. The larger the sweet spot a speaker has, the more locations the sound will be good in. Naturally, speakers that have larger sweet spots will sound good in a larger area. The sweet spot is an important consideration for larger rooms. If several people will be using the speakers, the sweet spot needs to be especially wide. However, a narrow sweet spot is adequate for personal use. Finally, take a little time to consider what you like about bookshelf speakers and how you want them to perform. Some people might put a lot of value on aesthetics, while for others sound is the only thing that matters. Take time to work out what you will mainly use the speakers for. Will it be listening or music or watching movies? Perhaps you enjoy hoisting wild parties and need plenty of volume. So, What Are The Best Bookshelf Speakers Available? With crisp and clear sound and plenty of bass, these speakers really deliver. Creating a concert in your living room is a breeze. Movie lovers will also be treated to an experience like never before. The speakers work perfectly as soon as they are plugged in. 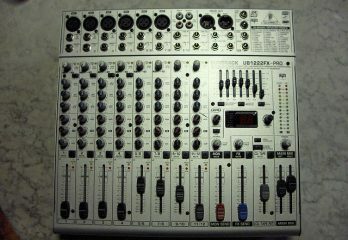 However, geeks who know what they are doing will be able to further tweak the sound to meet their specific needs. Those who are able to look beyond the rather dated and bulky design will be in for a real treat.